This is the second in a series of drawing lessons I created using Drawing With Children by Mona Brookes. I adapted her lessons to help children learn to draw in their nature journals. You can find all of the lessons in this series linked at the bottom of this post. If you want to print out all of the lessons in this series, there is a link for that below too! Work through the lesson as outlined in the book. Make sure to use the proper level for your child. 1. Page 90 in the “Where to start” section: Make sure to point out that when you draw flowers you will normally start at the center, with plants start with the stem, and when drawing a living creature start drawing with the eyes. 2. Using Figure 2-10 on page 91, practice drawing leaves with your thick and thin markers. Make sure to follow the suggestions in the paragraph titled, “Using thick and thin line”. 3. After working through the appropriate level in this lesson, go on to the section titled, “Choosing Other Projects” on page 112. Pay particular attention to the drawing sequence on page 114. Look for ideas for practicing the skills you learned in this lesson on your nature walk. If you can take a photograph of a scene or subject and then look at it on your computer or print it out, you will have a custom project to add to your nature journal. You could also use calendars, magazines, or field guides to help you with your project. Look through the colored illustrations in the middle of the book for some ideas of what other children have done for each of these categories. Click to each lesson for adaptations, suggestions, and videos. You can download all the Drawing With Children – Nature Journal Style Lesson Plans here: Drawing with Children Lesson 1 – Getting Started. The plans in Harmony Fine Arts Grade 4 relate the lessons to a study of great art and artists. Please see page 9 in the sample linked above to get an idea how I do this in the plans. Please note these are Amazon affiliate links to products I own and recommend. Drawing with Children (by Mona Brookes) is an amazing help to moms who want to help their children learn to draw. It gives even the most beginning artist the confidence to get started drawing things realistically using a variety of art supplies. As a nature loving mom, I adapted the lesson plans to go along with our nature study plans and applied the ideas to our nature journals. I am posting a series of suggested adaptations to the Drawing With Children lessons so you can do the same thing in your family. I would complete “Choosing Your Starting Level”, pages 40-52 without any changes. 1. As you learn the “5 Basic Elements of Shape”, make sure to have some objects from your recent nature walk to look at. Use those objects to find the elements of shape. 2. Play the “Visual Games” from page 64 while on your next nature walk. 3. Draw the bird as outlined on pages 75-79. Finish the bird drawing by sketching an actual tree branch that you have seen on your nature walk. 4. Before you move on to Lesson 2, practice drawing different birds you have observed by using a field guide or a bird photo. Use the basic bird drawing technique and adapt it to birds you have seen on a nature walk or at your bird feeder. Get all of the Drawing With Children -Nature Journal Style Lesson Plans here in one printable: Drawing With Children Nature Journal Style. There are several things that you can do to prepare for a successful day at the museum. I usually start by going to the museum’s website and looking for a button that will take me to their permanent collections. You can search on Google for the museum’s name, or I like to search on Wikipedia for the museum’s name. My next advice is to scan through the museum’s collection to see if there are any paintings you have already studied or artists that you are familiar with. You could pick an artist that has paintings at the museum to focus on and use resources you have or those from the library to share with your children before the trip. It always helps build enthusiasm if they are looking forward to seeing an artist they have learned about beforehand. You can print out a few of the paintings (postcard size) that you will see and let the children carry them with them as they walk through the museum, using the cards for a sort of “scavenger hunt”. I would suggest three paintings per child would be a good number to start with. It makes it more interesting when they actually have some reason to be at the museum other than just wandering around and not knowing much about the painters. Check the museum’s website for any lesson plans or activities they offer for children that relate to exhibits they have at the museum. You could even print out a map of the museum from most websites and this could help you plan your visit. It always helps to know where the restroom is for those little emergencies. 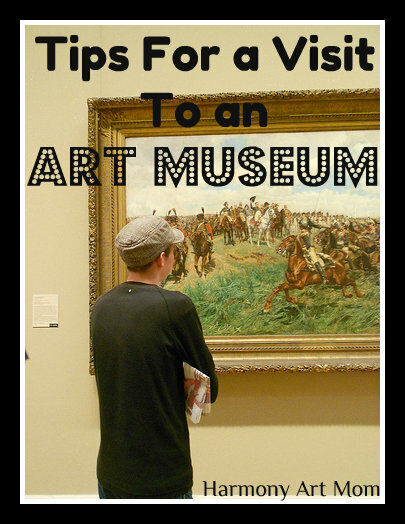 Another aspect that you need to prepare you children for is the “manners” part of visiting an art museum. There are certainly no hard and fast rules but just common sense and common courtesy. Most people come to the museum to relax and enjoy the artwork so it is best to use your best “library” voices when you are talking in the galleries. In the past, my husband and I tried to hold the children’s hands as we walked along and this not only helped to keep them from running in the museum, it made it easier to point things out or discuss what we were looking at. Plan to spend no more than 90 minutes actually looking at paintings. You will not be able to bring snacks into the galleries but most museums have some sort of cafe or outdoor eating area where you can take a break if you notice the children are getting weary. I usually plan to arrive as early as possible in the morning so my children are fresh. Make a trip to the restroom before heading to view the artwork. It is usually warm inside so leave the coats at the coat-check if the museum has one. Another activity you can do while at the museum is to have a “theme” for the day. You could decide you are going to look for artwork that has hats in it or you could look for artwork that has circles or trees or horses or whatever you decide. This makes it fun for the children to really look at the paintings and then share with you what they see. If your children are older and have studied a little art history, you could challenge them to look for artwork from a certain art period. Last but not least, plan for a few minutes in the museum gift shop. These little shops are like a treasure chest of art related books and resources. I always let the children pick out a postcard-size reproduction of some painiting we saw during our visit. We use these to follow-up our trip to the museum. A really fun idea is to take the postcard home and then have the child write some comments about the painting on the back of it to remember the experience with. I really hope that you all attempt an art museum trip this year. Once you try it, you will look forward to your next visit. We visit the Crocker Art Museum every year and we never tire of looking at the paintings. We have our favorites and we always find something new and interesting to look at. Edit to add: You may be interested to read about our trip to the Metropolitan Museum of Art in New York City: Harmony Art Mom’s Visit.